While the major TV networks will fall back on their tired old ‘red versus blue’ maps of the US this election season, RT America will approach the debate from an international angle. After all, the effects of the election will be felt around the world. On Election Day, RT will be hosting special live coverage from its studios in Washington, DC; New York City; Los Angeles, California; Miami, Florida; and Berlin, Germany. 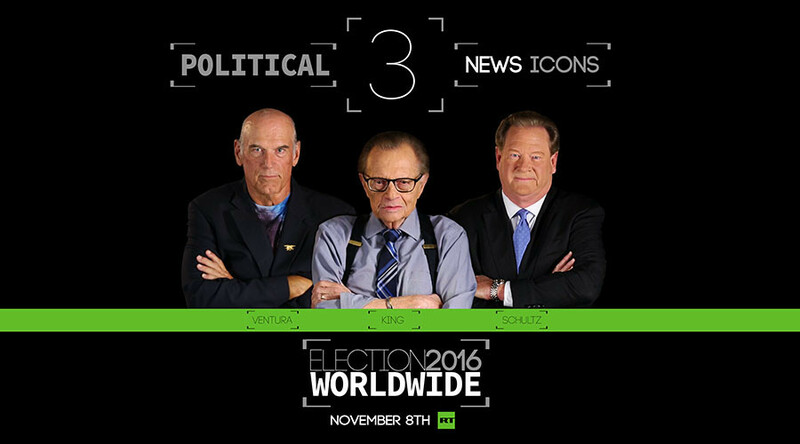 Called ‘Election 2016: Worldwide’, it will be co-anchored by legendary broadcaster Larry King, former governor Jesse Ventura, and veteran TV host Ed Schultz. It will also feature Tyrel Ventura and Tabetha Wallace, who will be going live from the presidential candidates' HQs. The broadcast team will examine important state-by-state results through a global lens, reflecting the impact of the event on the entire world, as a consequence of the United States' political, cultural, economic and military envelopment in matters across the globe. RT viewers worldwide will be able to watch the election coverage. The channel has an audience of 70 million weekly viewers in 38 countries and is the most watched news network on YouTube, with nearly 4 billion views. And RT will give a different perspective than that of the US mainstream media. RT America’s coverage of ‘Election 2016: Worldwide’ will begin at 4pm ET (20:00 GMT) on Tuesday, November 8. For a sneak peek at the special coverage, tune in on Monday after the presidential debate.